OvitaS is excited to announce Release 4 of our industry leading workflow and process management application, the Ovitas Workflow Portal (OWP). OWP 4 is released in conjunction with Release 4 of the Ovitas Content Lifecycle Solution Platform. Along with OWP 4, Ovitas has updated the Ovitas CMS, Ovitas Publishing Bridge (OPB), MeDaS Metadata Management (Medas) and our family of integration frameworks for Reporting, Portals, Content Ingestion, and Translation Management System (TMS) integration. Available by Browser and integrated with the Ovitas CMS 4 user interace, OPW 4 has been refreshed with modern design and framework. 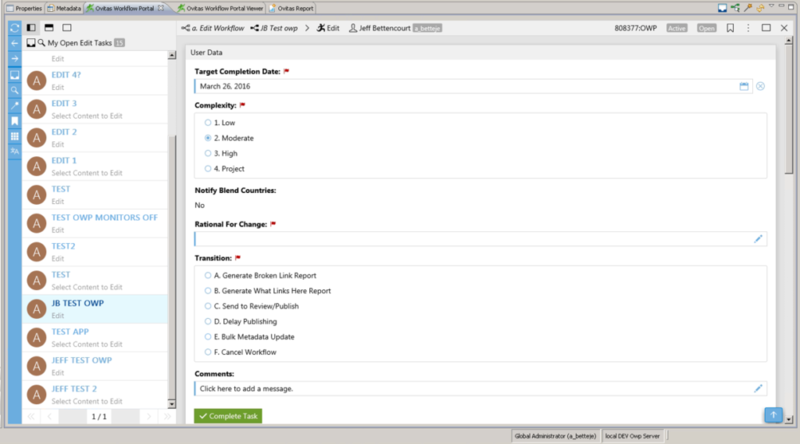 OWP 4 is built on Elastic Search for robust Search, Filtering, and “Outlook-styled” Inbox view. The Ovitas Workflow Portal (OWP) is a workflow, editorial and production process enterprise service that frees organizations to manage interactive and automated processes that may communicate with multiple content or data silos. OWP is part of the Ovitas Services Tier, and works independently with Ovitas CMS or other component content management solutions. OWP 4 provides a natural integration platform for the content lifecycle management solutions in an enterprise’s IT environment. It offers component services to automate and manage workflow process instances, event management, and system and composite application integration. Want a Demonstration? Just Ask! OvitaS is an employee-owned Network of Companies incorporated in the US and Hungary. The OvitaS International Network allows each organization to provide additional services, solutions, and expertise to its customers in North America, Europe, and the rest of the world.